The president of the Maldives, Mohamed Nasheed (on right in above photo), didn’t just agree to have solar panels installed on the presidential mansion; he helped put them in. 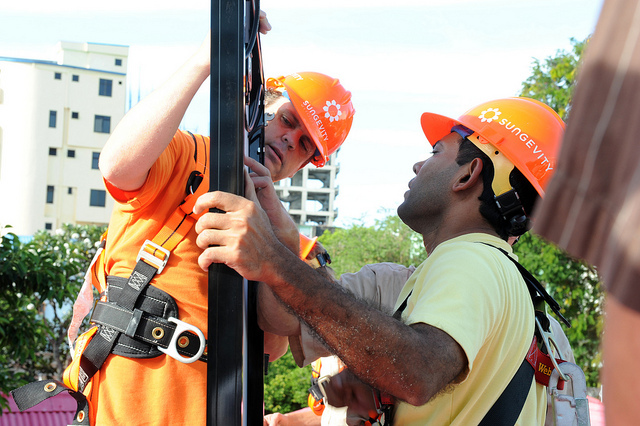 Nasheed scrambled up to the roof this week, screwdriver in hand, and joined the crew from California’s Sungevity, which installed the 11.5-kilowatt photovoltaic array. The Maldives, of course, is the poster country for global warming. The Indian Ocean archipelago rests, on average, fewer than five feet above sea level and the nation of some 305,000 people would be rendered uninhabitable by rising waters. Sungevity and Bill McKibben’s 350.org were behind the campaign to put solar on the U.S. White House. The Maldives rooftop installation is part of this Sunday’s 10/10/10 “Global Work Party,” another McKibben initiative to get people to take action against climate change. Nasheed, 43, has shown himself adept at focusing media attention on the impact of global warming on the world’s low-lying island nations — last October, he and his cabinet donned scuba gear to hold an underwater meeting. But putting solar panels on the presidential home is not so much a PR stunt as part of the nation’s aggressive efforts to wean itself from the imported oil it relies on to generate electricity. According to an official in the president’s office, the Maldives total electricity demand is 200 megawatts. A Finnish company, WinWind, has proposed building a 25-megawatt wind farm on the Maldives’ Gaaf Alif atoll, while Indian wind turbine maker Suzlon is investigating the feasibility of constructing a 15-megawatt wind farm on the Addu atoll. Japan has provided financial assistance for a project to install a megawatt’s worth of rooftop arrays on schools and government buildings in Male, the country’s capital. International donors, meanwhile, have promised $30 million for renewable projects. Scotland and the Maldives have signed an agreement to investigate the potential for developing wave and tidal power in the archipelago, according to the president’s office. To provide electricity when there’s no wind or sun, the Maldives is considering biomass power plants that would run on coconut husks. Outlying islands, however, would probably have to continue burning oil until the price of batteries used to store renewable energy became affordable. LG, the Korean company, donated the panels for the presidential solar array and the inverters were contributed by the German company Kaco. Sungevity used satellite images and its proprietary software to size and design the solar system at its Oakland, Calif., headquarters, then flew a crew to the Maldives to install it.